It was relaxer day boys and girls. At exactly 15 weeks I went in for a touch up. Surprisingly my hair was in much better shape than I was hoping because at the end of every stretch I'm terrified I did major damage to my locks. I didn't and short of a few tangles there wasn't a whole lot to worry about. I knew the left side of the back of my hair was more uneven than it had been in previous months. 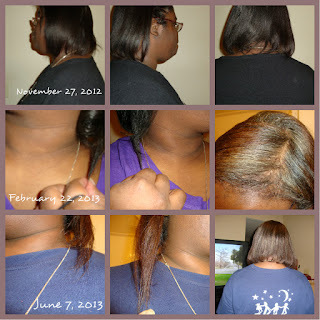 However, after the relaxer there was only a small section that was really problematic and a slight bob cut fixed that. My hair is still on my neck and brushing the top of my shoulders in the back and in the front has grown out quite a bit. When I stretched it out it hit the actual straps of my bra--not the band in the back the pieces on my shoulder lol. Since we didn't dye it either there is a mass of gray on the top going into a darker brown that fades into what looks like a lighter brown now. I'm okay with that, the gray seems to be advancing on its own without my assistance. We also discussed the broken edges but as they have grown back in and aren't looking abused I just need to keep nursing them. I also got to see a few natural puffs of hair that were cute but I know my brain just isn't ready for that. However, my new growth keeps impressing my stylist so each time I go in she asks about me wanting to go natural. I'm still dreading that I may not get to see her anymore. Maybe I can sneak back in four months. It would be a good escape from mom if she wasn't already off visiting and I could see the woman that's helped nurse my hair for the last seven years. Giant waste of money potentially but we'll see. Here are photos of the hair before I continue babbling. Since I was on that side of town I ran to Sally's to get some products before the move so I wouldn't have to hunt for them when I get there. They were having a strange sale lol that if you bought three full size natural hair products you got a free very vibrant colored bag. I needed my As I Am leave in and hydration elation so I grabbed those and then debated for a second but opted for the Taliah Waajid Great Detangler to use on my hair later in stretches when the tangles start helping me build upper body strength. Check the photos. After not eating much of anything but brownies yesterday I managed to eat well today lol. Had two shakes--at different times--grilled chicken from Zaxby's and a burger from Sonic. No fries cause I really only want those from time to time. I forgot to see if Harp's had the lemon oreos I'd been thinking about but Lord knows I don't need anymore sweets in the house. Back to house hunting in the morning and getting the final box count for the move. Oh and check out the new merchant at the right side. When I am again gainfully employed I'll be checking them out because they can custom tailor a dress to meet your needs. So no more of that I'd love the dress if only the sleeves were longer or the neckline was different--you can fix all of that yourself before you order. Hope everyone has a great weekend. Your hair looks lovely and healthier! It seems as if the greys are more concentrated at the front than elsewhere from the pictures. Thanks it feels really good and as long as the hairdresser is noticing the growth then I'm happy too even though when I take the comparison photos I can see it myself so that works too. And yes the grays are more at the front than anywhere else. The length of my hair is pretty good about taking the color and just going with it. My roots are pretty adamant about reminding me that yes lady there are lots of us and we aren't going away lol. When I was in college, I tons of grays popped up out of no where. I was slightly mortified. However, I think that it was possibly stress related because 5 years later---I don't have any gray at all. Really weird right? Awesome progress. I love how healthier and shinier it looks. Put up the good work! Ha at slightly mortified. I understand I was too in undergrad because I was trying to figure out what was going on then. I actually like the gray now and if the rest of my hair would catch up with the roots I'd be okay--even though that's partially my fault for dying them in the first place. I know I'll just continue to gray if I don't dye based on my family and that's okay. Thanks for the compliments. It feels better each time I go in. I just need to go back to basics and keep up the regimen without slipping when I get stressed out. Thicker hair, more length! Well done on the edges too. Thanks I don't think my hairdresser noticed till I pointed out they had grown back in and she was excited again. Love her and this process. A few years ago I probably would have done something crazy to just hide away the broken hair and now I know that with a little effort it will and can grow back in.